The family of Asia Bibi has begged the international community for help, saying they have "nothing to eat" as they remain trapped in Pakistan, along with the Christian mother of five. "Help us get out of Pakistan. We are extremely worried because our lives are in danger. We no longer have even anything to eat, because we cannot leave the house to buy food," Bibi's husband, Ashiq Masih, told Catholic charity Aid to the Church in Need. "Asia Bibi is in Multan jail and has not been released yet. We have not received orders to release her so far," said Zawar Hussain Warraich, minister for prisons in Punjab province. "Normally we receive orders in two days after court judgement and if relatives and lawyers of a prisoner are very active, they can bring it even within a day. But as far as Asia Bibi is concerned, it has not happened yet," Warraich added. "[The] Supreme Court should issue a directive to send us her release orders. We will release her as soon as we get it." Saif ul-Malook, Asia Bibi's defense lawyer, was forced to flee Pakistan in fear for his life following the ruling. Bibi's family has pleaded with Western powers for asylum, and according to Reuters, discussions are being held about how best to assist the mother of five and her family. On Tuesday, the government of Italy suggested that it will offer help. "I want women and children whose lives are at risk to be able to have a secure future, in our country or in other Western countries, so I will do everything humanly possible to guarantee that (for Bibi)," Deputy Prime Minister Matteo Salvini said. "It is not permissible that in 2018 someone can risk losing their life for a ... hypothesis of blasphemy," he added. Canada's foreign minister, Chrystia Freeland, added that the safety of the Christian mother is of great importance. 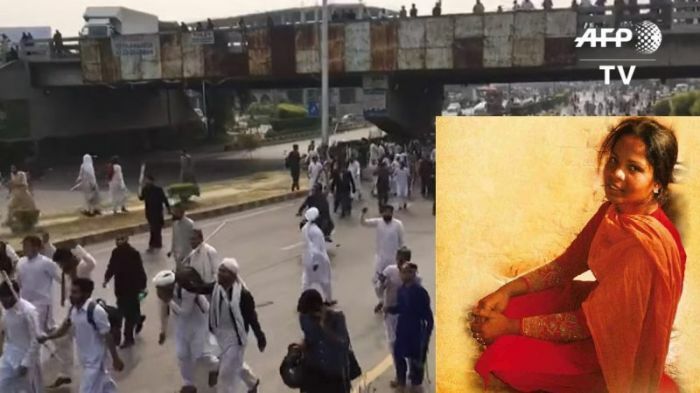 "Canada calls on Pakistan to take all measures necessary to ensure the safety and security of Asia Bibi and her family," she said. "Canada is prepared to do everything we can" and is "extremely engaged in this issue." In the meantime, Masih warned that the uncertainty and danger that the family faces is taking a heavy toll. "The daughters are weeping. They still haven't seen their mother. The family is totally shattered," the husband and father said.